"Making the impossible become possible today!" Did you ever dream you could turn your grey hair into dark hair again? Yes, it's no more a dream! You can make it happen by ordering the product from us at the VIP LASER CLINIC! Grey Hair is one of the most common signs of aging. Some unlucky people go grey long before retirement and almost everyone will eventually show some signs of grey hair after the age of 50. Grey hair may contribute to a distinguished look, but salt and pepper is not for every one. For many image conscious people, grey hair can make you look older than you feel. 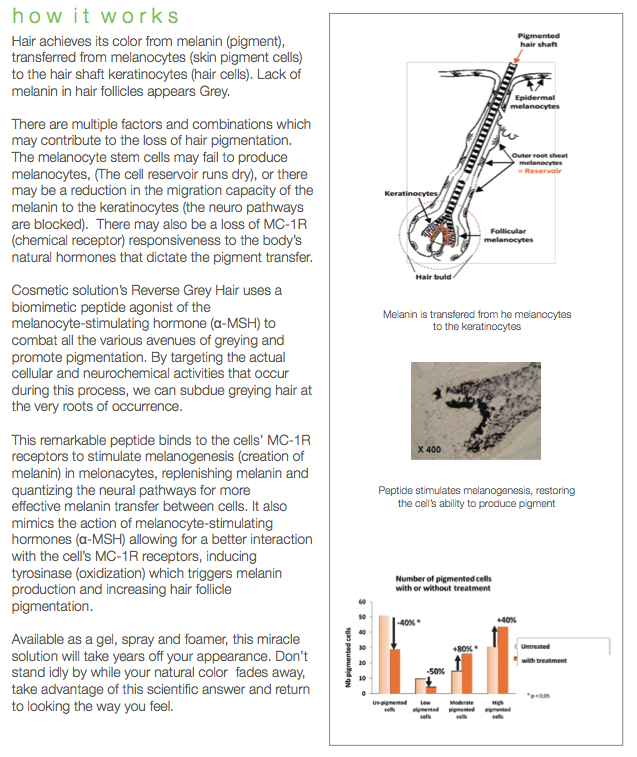 Professional Solutions' groundbreaking "Reverse Grey Hair" is a new neurodermatological marvel that revives your hair's natural ability to produce pigment without having to resort to harmful chemical dyes. 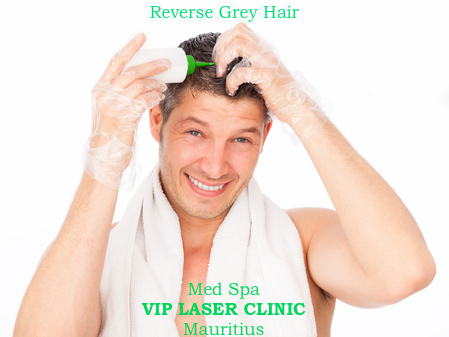 Finally you can get a cosmetic treatment that reverses grey hair to dark with noticeable results. Apply directly on scalp twice daily, every morning and every evening. Use enough to dampen scalp and gently massage into scalp with fingertips. Results may occur within two months with twice daily usage. For some users, it may take as long as 4 onths to see results. Purified Water (Auqa), Glycerin, Dextran, Acetyl Hexapeptide-1, Hyaluronic Acid, glyceryl Polyacrylate, Hesperidin Methyl Chalcone, Steareth 20, Silk Amino Acids, Sodium Cocoyl Acids, Potassium, Dimethicone PEG-7, Panthenyl Phosphate, Phenoxyethanol, Ethylhexylglycerin.